Joe D’Orazio was born on the 27th July 1922 in Bermondsey, South London, of Italian parents. He was brought up in a very tough working environment. In fact, two of his classmates were later hanged for murder, and five others became professional wrestlers. Joe was educated at English Martyrs Roman Catholic School in Walworth, attending school with Harry Geoghegan who went on to become a fine wrestling referee. At 13 years of age, Joe was elected by his classmates as the youngest ever Captain of the school. 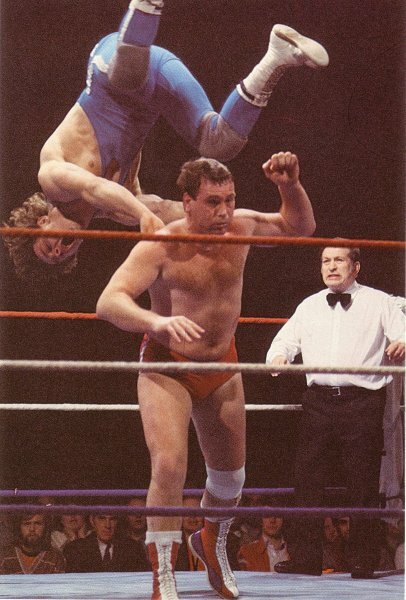 Joe’s best friend until his untimely death in 2003 was the South London iron man and for many years Mick McManus’s tag partner : Steve Logan. Joe’s Grandfather owned what was considered to be the best fish and chip shop in South London and this is where Joe worked until the outbreak of the Second World War. During the Luftwaffe’s horrific blitz on London, before enlisting in the Royal Air Force, Joe worked as a member of a demolition squad, knocking down bombed buildings in the City of London. The war meant the parting of the ways for best pals Joe and Steve Logan. 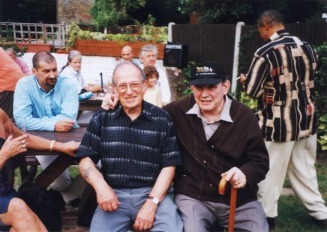 Joe was to spend 4 years in the Royal Air Force air/sea rescue unit, while Steve was away with Montgomery’s 8th army, serving as a desert rat in El Alamein, but they managed to keep in contact by mail, throughout the war, and afterwards renewed their old friendship. On leaving the armed forces, Joe took up Judo and Steve took to boxing as well as Judo. George Chew, and in just over a year , went from novice to Black Belt 1st Dan. Joe and Steve were key members of the 4 man Judo team that took the interclub Judo team title in 1948 at the Chelsea Town hall. 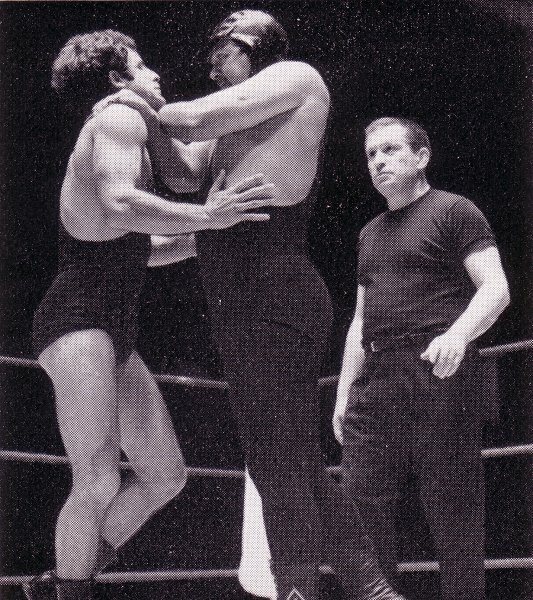 Joe became a Professional wrestler in 1948, closely followed by his old friend Steve Logan,Joe’s cousin : Mike Marino was already established in the wrestling business. His first professional match was against the New Zealander Russ Bishop in Poole Dorset. Joe’s abilities were quickly recognised, and he was soon in great demand by all the top Promoters to wrestle on their shows. By 1950, Joe was made a honorary member of Gruppo Autonomo Lotta Giapponese, and travelled to Rome for the presentation of his membership enrolment. For the next 20 incredible years, he wrestled all over Britain and Europe. His tag partner during this hey day of grappling, was the inimitable entrepreneur : Paul Lincoln,who was sometimes known as the fearsome Doctor Death, but doubled up with Joe as Togo Tani. However, after several injuries, he decided to retire to ‘avoid becoming an invalid for life’. His last Professional bout was against the legendary George Kidd in 1968. Unable to shake off his passion for wrestling which was in his blood, ( see ‘a Wrestlers Lament’, his 159th poem,- below), he returned as a referee, only to break his nose twice in the first six months. 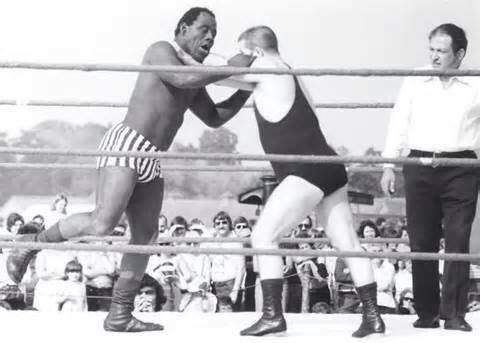 However, he persevered, and as in his earlier wrestling career, refereeing took him to many places including Blenheim Palace, Olympia, Café Royal, , Lyceum Ballroom, Paisley Ice Rink, Paris, Belgium, Berlin’s Big Top, Hanover Big Top, King Hussein Stadium in Jordan, Italy and many more. 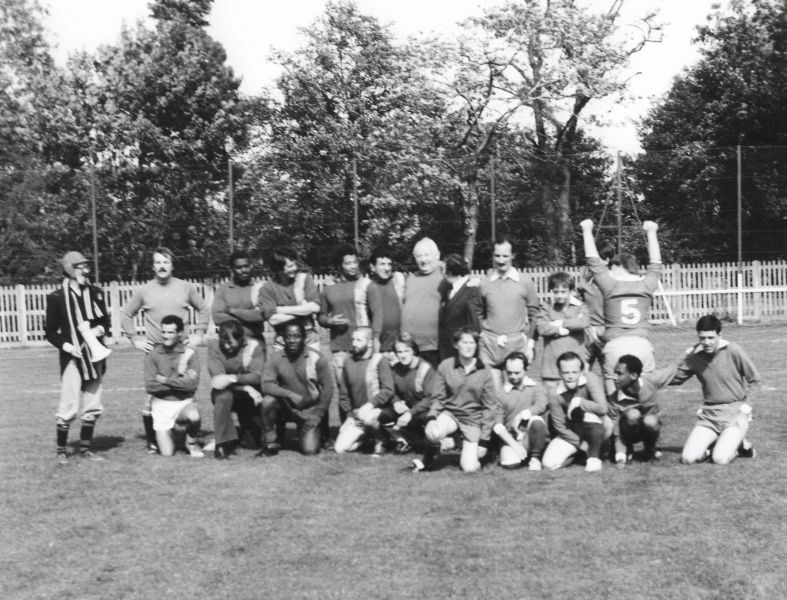 For a further 20 years, he was resident referee at London’s prestigious Royal Albert Hall Tournaments,becoming a favourite of his Royal Highness the Duke of Edinburgh, with whom he became quite friendly. Joe has made many friends in wrestling over the years. Despite their often fearsome uncompromising ring image and reputations, wrestlers have a common bond and their loyalty and enduring friendships are admirable. 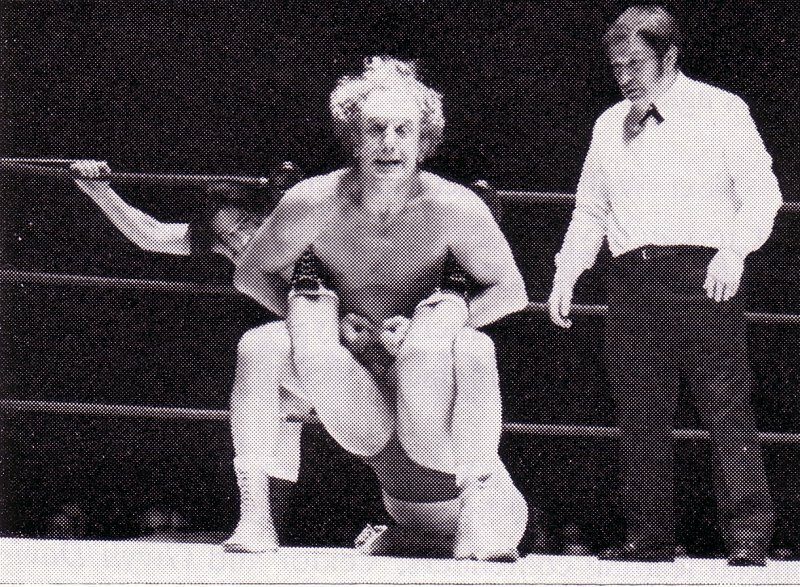 Here are some photos from his extensive collection, working with the greats of wrestling. Away from the ring, Joe became a member of Mickey Woods ‘Tough Guys Unlimited’ stunt team.He did lots of film and television stunt work, a highlight coming when he doubled for Hollywood star :J.Carroll Naish whilst filming the TV series ‘The New Adventures of Charlie Chan’. He also stunted and acted in ‘Camp on Blood Island’ and ‘Terror of the Tongs’ , and appeared in the film ‘Geordie’. Joe worked in Rome on ‘Quo Vadis’ , 'A matter of Honour', and was a gunslinger in the Wyatt Earp Show, when it came to the U.K. from America, plus a starring part in 'Night and the City' with Richard Widmark. Other television work included ‘King and Castle’, ‘Flight through the Branches’, ‘Young Charlie Chaplin’, ‘Blind Justice’, ‘Radical Chambers’, ‘Story Board’, ‘Rumpole of the Bailey’, and more recently : Londons Burning’, ‘The Bill’, Henry Kelly’s early morning breakfast show, He also starred in one episode of Humphrey Burton’s ‘The Age of Aquarius –The Wrestling Poet’. On radio, Joe worked on the ‘Late Night Show’, with Monty Modlyn, and was on the panel with Monty and Anne Shelton, which ended up with Joe singing a duet of ‘My Old Man said follow the van ‘ with Miss Piggy. Up until then his role had been to answer listeners questions on wrestling ! In 1991, following the sad demise of the TV wrestling favourite and charity worker extraordinaire : Catweazle from cancer, Joe realised that there was a need for wrestlers to hold a regular get together and not just at funerals. 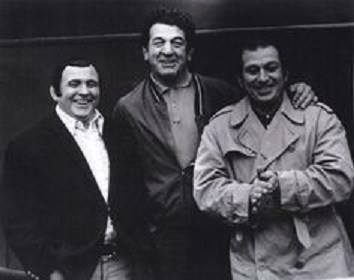 Mal Mason subsequently held a gathering in his Kent garden, but only managed to attract 6 people, and then Joe decided to Found the British Wrestlers Reunion with the aid of Tony Scarlo . Their next attempt several weeks later, also in Mason’s home, rose to 13 visitors, with the result that the event was moved to London , in the pub owned by the great dazzler himself: Joe Cornelius. One year later, the Dazzler emigrated and Wayne Bridges assisted by his lovely partner : Sarah Bridges took over as hosts, a role that they have adopted since. 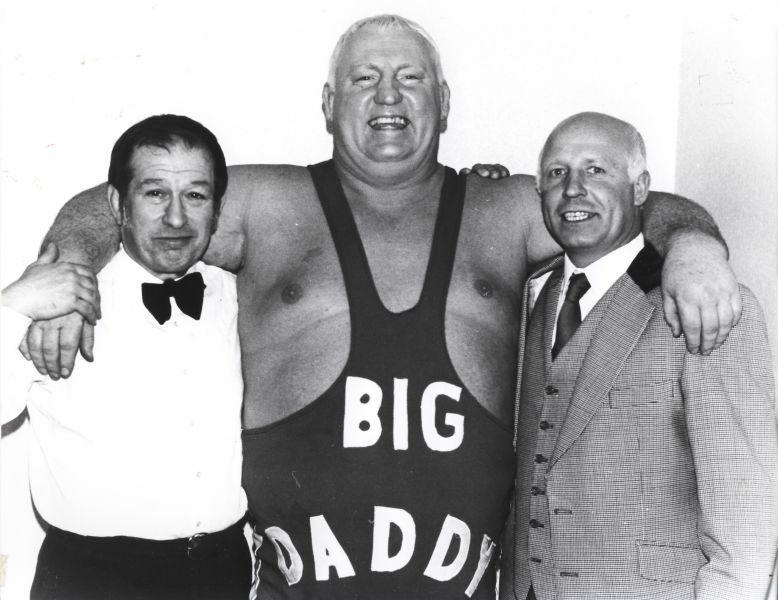 Although Scarlo and Mason have since left the fold, relinquishing their responsibilities some years ago, the Reunion with Joe at the helm, has grown out of all proportion and flourishes to this day, to have become the largest Annual gathering of its type in the world, only exceeded by the Cauliflower Alley Club in the United States. As a mark of recognition for all his efforts in achieving this remarkable feat, Joe was made Life President in 2003. In 1990 the Reunion and Steve Grey in particular, commissioned a sketch drawing by a celebrated artist depicting some of the great mans achievements in gratitude for everything that he has done for the community. A rather lesser known facet of the great mans unending list of talents, is that Joe D’Orazio is an accomplished artist/painter, selling a lot of his art work in exhibitions, with the rewarding result of him being recruited many years ago by the Teachers of Crispin House, an Adult Training Centre for the mentally handicapped in Bermondsey, and where he worked full-time for over a decade.He surprised everyone, not only by teaching severely handicapped people to paint, but also exhibiting their work and selling a number of paintings. Joe’s students have exhibited at South London Gallery in the Park, Southwark, The Stock Exchange, St Johns, Piccadilly, Royal College of Art, The New Cross Art House, and Southwark Cathedral. 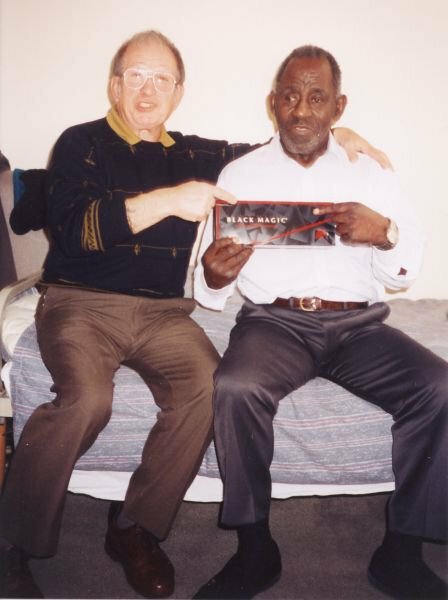 Joe is constantly asked by Handicapped schools all over London to give art seminars .He was originally introduced to this rewarding work by the great Steve Grey , who has also shared a lifetime career in the care Business. 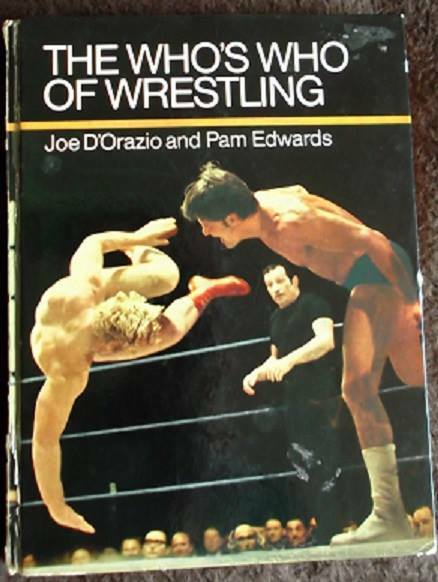 As a writer, Joe is a successful writer of prose, and in 1971 wrote ‘The Who’s Who of Wrestling’ with Co-Author : Pam Edwards. A book which has become an all-time favourite reference manual on grappling. The book was written in parallel with his refereeing career, he worked for Dale- Martin Promotions Ltd’s publicity Department ( at that time, the world’s largest Promoter of Professional Wrestling) . His work included the preparation of write-ups and programme material for all their shows, which in those days could often run to as many as 10 per day! Joe also turned out a weekly column in ‘Business’ and for many local papers throughout Great Britain. Joe D’Orazio was researcher for the ‘TV Times’, ‘Guide to Wrestling’ ,and compiler of ‘The Cover Men of Wrestling’ . He supplied copy to ;Wrestling review’, ‘The Wrestling Monthly‘Weekly Sporting review’, and ‘Show Business’, ‘Smash’, ‘Ring Wrestling USA’, ‘Tiger Annual’, ‘Beano Annual’, ‘The Royal Albert Hall Centenary Compendium’, plus countless other publications worldwide. In 2011, he was still working on another four books ! As a celebrated poet, he has had many books of poetry published, and continues to write. To date, he has written over 300 poems. Like ‘Ode to Mad Hannah’, his long masterpiece. Many are deep ,dark, meaty and haunting . Some of his lyrics inspired by his lovely Italian born wife: Tina, are soft and touching. He says “I never thought about poetry until I met her”. His work is varied, sonnets ranging from love through odes to tramps and meths drinkers, ‘Old Beppo the Potter’,‘an Italian Resistance Worker’, ‘Mick McManus’, ‘The Income Tax Man’, and ‘Tell them I sleep’. Joe D’Orazio is a true legend and inspiration to us all, and we should feel deeply honoured, if we have been privileged to cross paths with this wonderful modest man as he passes through our lives !!! But the trouble is I love it.